THE 2015 PLAIN SPOKEN TOUR IS UNDER WAY! With 2008’s "Life, Death, Love and Freedom," 2010’s "No Better Than This" and the September release of "Plain Spoken," Mellencamp has delivered three of the finest albums of his career..."
"A rock band playing with maximum passion and communal bonding with the audience..."
"79 dates ahead to mine the roots of American music and investigate what it means to live and die..."
"It was clearly no accident that he opened with "Lawless Times" and "Troubled Man," introducing in the first song the notion of an unfair world that can overwhelm, and following with one that details the consequences." "I laughed out loud once, I won’t do that again," he sang in "Troubled Man," but there wasn’t defeat in his voice. It sounded more like survival. Then, in a brilliant bit of pacing, he went into "Minutes to Memories," a 1985 song that deals with similar themes and explicitly about survival." Launching into "Small Town," and it was all over at that moment: The room was his, we were a family of fans, a collection of lawless women and troubled men celebrating a moment when everything felt pretty great despite the long odds..."
Read the complete reviews (including setlists) with links to photo galleries from the shows HERE. Follow John's tour on social media! Fans have been posting awesome INSTAGRAM shots, FACEBOOK photos and videos and some great YOUTUBE VIDEOS from the first week of shows! Make sure to tag your social media posts with #jmplainspokentour. Remember each Plain Spoken Tour Ticket purchase includes a download of John's new album Plain Spoken. Redeem your download today! Purchasers have been emailed redemption instructions. If you did not receive your email, forward us your order confirmation or email us help@mellencamp.com for further assistance. DON'T MISS OUT ON THE 2015 PLAIN SPOKEN TOUR DIAMOND PACKAGE! There are a limited number of Diamond Ticket Packages remaining for John's 2015 Plain Spoken Tour, so be sure to act fast before they are gone -- many show's packages have already sold out! The Diamond Packages are amazing seats with exclusive and limited edition commemorative items and are THE way to get an up-close and personal experience with John and the band! 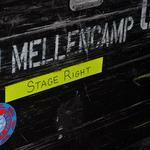 To be part of this intimate experience visit Mellencamp.com's TOUR section to learn more about the Diamond Package! Rock 'n' Roll Hall of Famer John Mellencamp gets personal in a unique interview with Jann Wenner, the publisher of Rolling Stone Magazine, for National Public Television’s new series Speakeasy. Filmed at The McKittrick Hotel in New York City in October of 2014, John answers questions and discusses his early days as Johnny Cougar, his work with Stephen King, and Farm Aid, as well as his recently released new album Plain Spoken, and work as a painter. Mellencamp’s candid conversation also explores his philosophy on success, what drives his passion for expression, and his uncompromising creative will. Visit Mellencamp.com to watch a preview clip of the episode and for a complete list of stations airing Speakeasy this month. Check our news article often as new stations are being added to the list daily! Be sure to check local listings for broadcast datesand times. NEW TOUR MERCHANDISE IN THE MELLENCAMP.COM STORE! 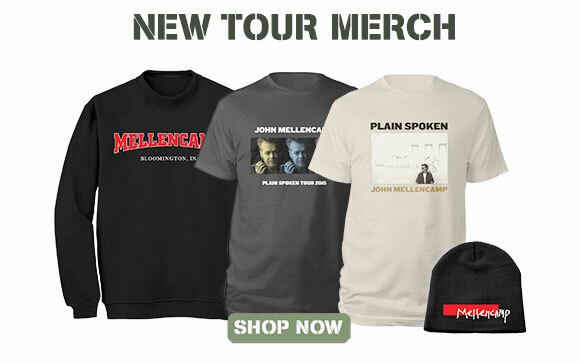 Check out all the cool new merch from the 2015 Plain Spoken Tour now available at the Mellencamp.com store. Brand new Mellencamp sweatshirts, new colors in the ladies "Pink Houses" tee, a Mellencamp beanie, and don't miss the official Plain Spoken Tour Tee with more items to come! Agreed, those 3 albums are some of his finest. From what I've seen, the set list for this tour is great. Nice mix of the classic Mellencamp songs we know and love along with some new ones and 2 from Ghost Brothers that I'm sure many of us haven't heard. It's what you do and not what you say, if you're not part of the future then get out of the way.